In all, the Mounted Recruiting Service operated recruiting stations in nineteen cities during the war. Although it was not required, in most cases the officers recruited soldiers for their parent regiments. This meant that at various points during the war, some cities provided soldiers to multiple regular cavalry regiments. Boston, Massachusetts. This was the first war-time station established. Lieutenant Napoleon B. McLaughlin of the 4th U.S. Cavalry opened the station on July 5, 1861. He was promoted to captain before he was ordered to report to his regiment over a year later on October 1, 1862. He was relieved by Captain Abraham K. Arnold of the 5th U.S. Cavalry, who was ordered to close the station at the end of the following month. The station did not reopen until June 10, 1863, when Lieutenant Copley Amory of the 4th U.S. Cavalry assumed command. He operated the station until he resigned in December, and it was not reopened again during the war. Cincinnati, Ohio. Lieutenant Edward M. McCook of the 4th U.S. Cavalry opened this station on July 24, 1861. In September, he was placed on leave to take service in the state forces of Indiana. He earned five brevet promotions for gallantry in action as a volunteer officer during the war, the last to major general of volunteers. The station was vacant for two months until McCook was relieved by Lieutenant Robert S. Smith of the 2nd U.S. Cavalry on November 6, 1861. 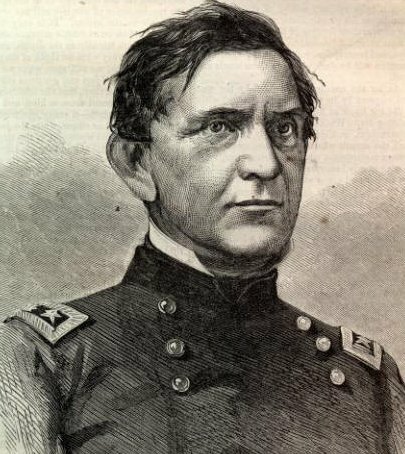 A native of Ohio, Smith as previously mentioned spent over three years in Cincinnati before he was relieved by Captain David S. Gordon, also of his regiment, on September 5, 1864. Gordon was transferred back to his regiment in December, and replaced by Lieutenant Robert S. Sweatman of the 5th U.S. Cavalry. Lieutenant Sweatman served only two months before being transferred back to his regiment in February 1865, and Captain Isaac R. Dunkelberger, of the same regiment, finished the war in charge of the station, making it one of the few stations continuously manned throughout the war. New York, New York. Lieutenant William W. Webb of the 4th U.S. Cavalry opened the recruiting station in New York City on October 3, 1861. He wasn’t relieved to join his regiment until February 7, 1863. His replacement was Captain Arnold of the 5th U.S. Cavalry, only three months after finishing his recruiting duties in Boston. Arnold finally returned to his regiment in September, and was replaced by Lieutenant John B. Johnson of the 6th U.S. Cavalry. Lieutenant Johnson was transferred back to Carlisle Barracks on August 22, 1864, and Lieutenant Stanwood of the 3rd U.S. Cavalry commanded the station for a mere two weeks. Former prisoner of war Lieutenant Tattnall Paulding of the 6th U.S. Cavalry relieved him on September 4, 1864, and stayed there for the remainder of the war. Wheeling, Virginia. Captain Milton T. Carr of the 1st U.S. Cavalry opened this station on August 22, 1862. Lieutenant Judson Haycock was sent to assist him on September 8th, and relieved him on December 7, 1862 so he could return to his company. Lieutenant Haycock closed the station on March 4, 1863. Lieutenant William Webb of the 4th U.S. Cavalry briefly served in the town as a mustering officer for volunteer regiments from June 6 to September 23, 1863, but the recruiting station did not reopen during the war. Buffalo, New York. Lieutenant Charles McKnight Leoser of the 2nd U.S. Cavalry opened this station on July 13, 1862 to assist in recruiting troopers for Companies A, B and D of his regiment. He closed the station when ordered back to his regiment on April 8, 1863, and it did not reopen. Norristown, Pennsylvania. A native Pennsylvanian and former first sergeant of John Buford’s Company B, Lieutenant Thomas Bull Dewees of the 2nd U.S. Cavalry was the sole operator of this recruiting station from July 13 to November 17, 1862. Cleveland, Ohio. Lieutenant William Blanchard of the 2nd U.S. Cavalry opened a recruiting station in Cleveland on August 7, 1862. He was relieved by Captain Robert E. Clary of the same regiment on October 4th, who closed the station when transferred back to his regiment on December 7, 1862. Captain Thomas Drummond of the 5th U.S. Cavalry reopened the recruiting station on October 15, 1863 and conducted recruiting there until transferred back to his regiment on December 21, 1864. Interestingly, Drummond left command of his regiment in the field for recruiting duty, and resumed command when he returned. Lieutenant John Mix of the 2nd U.S. Cavalry, another former prisoner of war, commanded the station from January 4, 1865 through the end of the war. Indianapolis, Indiana. Lieutenant Edward T. Benton of the 1st U.S. Cavalry opened a station in Indianapolis on August 22, 1862. Captain Charles W. Canfield of the 2nd U.S. Cavalry took charge of the station on January 15, 1863, and Lieutenant Benton was transferred back to his regiment on February 6th. Captain Canfield was in turn ordered to close the station and return to his regiment to take command of his company just three weeks later, on February 26, 1863. Pittsburgh, Pennsylvania. Lieutenant Theophilus F. Rodenbough of the 2nd U.S. Cavalry opened this station on September 4, 1862. It was probably established in the same National Hotel that the 6th U.S. Cavalry used during recruiting the previous year. Rodenbough closed the station when transferred back to his regiment on December 7, 1862. Captain Clarence Mauck of the 4th U.S. Cavalry opened a new station in December 1864. He was relieved on March 1, 1865 by Lieutenant John B. Johnson of the 6th U.S. Cavalry, but returned to the station before the end of the month. Baltimore, Maryland. This station was also opened on September 4, 1862, by Lieutenant Anson O. Doolittle of the 4th U.S. Cavalry. He was ordered back to Carlisle Barracks on November 29, 1862, and recruiting was not resumed here until Captain John B. McIntyre opened another station on April 6, 1865. Philadelphia, Pennsylvania. This station opened and closed three different times during the war, odd for one of the largest cities in the nation. Lieutenant Charles H. Gibson of the 2nd U.S. Cavalry, a native Pennsylvanian, was ordered to open a station here in October, 1862. It may well have been the same location at the Girard House on Chestnut Street used by the 6th U.S. Cavalry until that February. He was transferred back to his regiment on September 13, 1863. Lieutenant John H. Nichols of the 1st U.S. Cavalry operated a station here for two weeks in April 1864 before returning to his regiment for the spring campaign. He was killed in action just two months later at the battle of Trevillian Station. Captain T.F. Rodenbough of the 2nd U.S. Cavalry opened the station for the final time during the war on November 18, 1864, less than two months after losing his arm at the battle of the Opequon, or Third Winchester. He turned the station over to Captain William Hawley of the 3rd U.S. Cavalry when ordered to rejoin his regiment on April 25, 1865. Chicago, Illinois. The records concerning this station are curious. Captain John Feilner of the 1st U.S. Cavalry was ordered to open a station in Chicago on October 4, 1862. However, Feilner was dropped from Carlisle’s post return at the end of the month, which would normally mean he had completed his duties and been sent back to his regiment. I also have not yet come across a single soldier recruited by Captain Feilner in Chicago, which leads me to believe the order was countermanded before the station could be opened. Detroit, Michigan. Lieutenant and former first sergeant Thomas McGregor of the 1st U.S. Cavalry was the sole operator of this recruiting station from October 16, 1862 to January 20, 1863. This was his first assignment after receiving his commission. He later received a brevet promotion for gallantry at the battle of Todd’s Tavern. Elmira, New York. Captain William McLean of the 5th U.S. Cavalry was the sole operator of this recruiting station from November 1, 1862 to February 19, 1863. Severely wounded and captured during the Peninsula campaign, he opened the station once paroled and left it to take command of his newly organized Company M. Unfortunately, he died of fever just two months later, on April 23, 1863, in Washington, D.C.
Washington, D.C. Captain Samuel H. Starr of the 2nd U.S. Cavalry recruited many men for his regiment here in October 1862 after resigning his volunteer commission, many of them prior volunteers from his New Jersey brigade. Interestingly, I found no record of him being assigned to the Mounted Recruiting Service, though he definitely served this duty. Lieutenant Elisha W. Tarlton of the 3rd U.S. Cavalry operated the only official recruiting station in the city from November 1, 1862 to March 1, 1863, when he was transferred to his regiment. A native of Kentucky, he later earned a brevet promotion for gallantry in action at Tuscumbia, Alabama. Harrisburg, Pennsylvania. 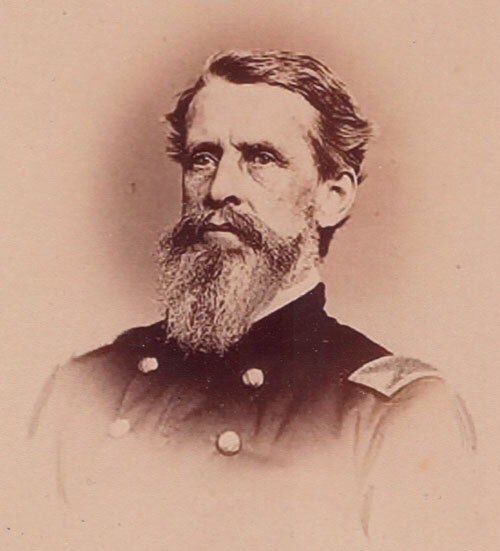 Captain Marcus A. Reno of the 1st U.S. Cavalry was ordered to open a recruiting station in Harrisburg while recovering from injuries sustained at the battle of Kelly’s Ford on March 17, 1863. Other than a brief absence serving with Pennsylvania troops during the Gettysburg campaign, he operated the station until September 23, 1863, when he was relieved by Lieutenant John McDonald of his regiment. Lieutenants Reuben Bernard and William Pennock, also of the 1st U.S. Cavalry, were assigned here as mustering officer in July and August of 1862, and probably operated from the same office. Lieutenant McDonald, another former first sergeant, was transferred back to his regiment on November 26, 1864, and the station remained closed until opened by Lieutenant (and yet another former first sergeant) Dean Monahan of the 3rd U.S. Cavalry on March 12, 1865. Madison, Wisconsin. Lieutenant Anson O. Doolittle of the 4th U.S. Cavalry, assigned again to recruiting duty, was the sole operator of this station from January 8 to May 1, 1864, when he was ordered to report to the adjutant general. The assignment is understandable, as Doolittle was appointed to the Army from Wisconsin, and briefly served as a lieutenant in the 2nd Wisconsin Infantry prior to receiving his regular army commission. Rochester, New York. Lieutenant Thomas Simson of the 6th U.S. Cavalry opened this station on May 12, 1864. Badly injured at Franklin, Tennessee, he had finally reported to his regiment the preceding month, but was not yet fit for field duty. Lieutenant Frank Stanwood of the 3rd U.S. Cavalry relieved him on December 21st, when he was transferred back to his regiment. Lieutenant and former sergeant major Tullius C. Tupper of the 6th U.S. Cavalry relieved Stanwood in turn on February 7, 1865. St. Louis, Missouri. Captain John A. Thompson of the 4th U.S. Cavalry was the sole operator of this station from August 13 to November 1, 1864, when he closed it and returned to his regiment. He had received a brevet promotion for gallant and meritorious service at Hoover’s Gap, Tennessee the previous year. Heitman, Francis B. Historical Register of the United States Army, volume 1. Washington, D.C.: The National Tribune, 1890. Henry, Guy V. Military Record of Civilian Appointments in the United States Army, volume 1. New York: George W. Carleton, 1869. Price, George F. Across the Continent with the Fifth U.S. Cavalry. New York: Antiquarian Press Limited, 1959. Tousey, Lt. Col. Thomas G. Military History of Carlisle and Carlisle Barracks. Richmond: The Dietz Press, 1939. As 1864 opened, the only four operating recruiting stations were Cincinnati, Cleveland, Harrisburg and New York. Lieutenant Anson Doolittle of the 4th U.S. Cavalry added a fifth in Madison, Wisconsin on January 8th. In April, the growing controversy surrounding repairs to the post reached a head. There were a number of issues concerning the contracts and materials needed to repair the post after July’s attack, and then-Captain Hastings wrote on several occasions for guidance and clarification from the Quartermaster General concerning the repairs. Naturally enough, those who did not receive contracts or orders for material were disgruntled. As post commander, Hastings was of course at the center of the storm. Unfortunately for him, he had unwisely pursued repairs without the specific approval of the Quartermaster General, and found himself in a great deal of trouble as a result. Hastings, who had been promoted to major in the 5th U.S. Cavalry in September, was relieved of command on April 21, 1864. Charges were subsequently preferred, which led to a conviction by a General Court Martial. The sentence was initially very severe, but was later commuted to six months suspension of pay and benefits, causing a Congressional investigation. In December, Major Hastings was permitted to retire “for incapacity resulting from injuries received, or from exposure in the line of duty, in conformity with an Act of Congress, of August, 1861.” Lieutenant Hancock T. McLean of the 6th U.S. Cavalry, assigned to the post the month before, briefly assumed command of the post. Thomas Tousey, in his book Military History of Carlisle Barracks and Carlisle, provides a thorough discussion of the issues surrounding Hastings’ dismissal. On May 19, 1864, Major William B. Royall of the 5th U.S. Cavalry assumed command of the post. Like the two officers who had preceded him, Royall was another very experienced cavalryman. He initially entered service as a volunteer officer at the beginning of the Mexican War, and had been assigned to the 5th (then 2nd) U.S. Cavalry when it was formed in 1855. He was severely wounded during fighting at Old Church, Virginia on June 13, 1862. He received six saber wounds in hand to hand combat, including “two sabre-contusions on the right side of the head; a cut two inches long on the forehead; a long cut on the left cheek which bled profusely; a cut on the right wrist, dividing a tendon; and an incised fracture, four inches long, of the left parietal bone.” He received a well-deserved brevet promotion for his conduct in the battle, but recovering from his many wounds took many months. He came to Carlisle after serving two months at the Cavalry Bureau in Washington. As spring turned to summer, activity increased around the depot. The Madison recruiting station closed, and a new one opened in Rochester, New York. Since the regiments were involved in active campaigning, officers from Carlisle were ordered to conduct parties of recruits to their new regiments. If annotated on maps or in reports, these detachments were labeled with the regiment of the officer leading them. A detachment of recruits bound for the 1st U.S. Cavalry led by an officer of the 3rd, for example, would be noted as a detachment of the 3rd U.S. Cavalry. Lieutenant Hancock McLean of the 6th U.S. Cavalry conducted a detachment of recruits to the 5th Cavalry in late May. Lieutenant Frank Stanwood of the 3rd Cavalry led a detachment of recruits to the 5th & 6th U.S. Cavalry in late June. During Confederate Lieutenant General Jubal A. Early’s advance on Washington the following month, Lt. Stanwood was ordered by the commander of the Department of the Susquehanna to scout south toward the Potomac. This seemingly errant band of regulars of the “3rd U.S. Cavalry,” which never served in the eastern theater during the war, has caused confusion among researchers, including this author. The remainder of the summer and fall passed unremarkably. Captain Thompson of the 4th U.S. Cavalry opened a recruiting station in St Louis in August. Lieutenant Stanwood conducted another party of 155 recruits to the 5th U.S. Cavalry in October. An additional 135 recruits were transferred in November, and 142 more in December. Captain Thompson closed the recruiting station in St Louis in November, while stations reopened in Pittsburgh and Philadelphia as the year’s campaigning drew to a close. During the early months of 1865, the depot continued to forward recruits to the field: 129 in January, 134 in February, 123 in March and 94 in April. It is doubtful this last group reached its destination before the cessation of hostilities. At the end of the war, recruiting stations were still operating in Cincinnati, Cleveland, New York, Philadelphia, Pittsburgh and Rochester. The careers of several officers other the commanders were significantly affected by recruiting duty. Copley Amory of the 4th U.S. Cavalry was appointed a second lieutenant from Massachusetts on August 5, 1861. He returned to Carlisle from May to December 1862, when he was returned to his regiment. He was again assigned to the depot in June 1863, this time forwarded to the recruiting station in Boston. After six more months of recruiting duty, he resigned in December 1863. Irish-born John McDonald enlisted as a private in Company K, 1st U.S. Dragoons in 1857, and was promoted to first sergeant prior to his appointment as a lieutenant in the same regiment. He was assigned to the depot in October 1862, remaining until ordered to rejoin his regiment on February 6, 1863. On June 15, 1863, he was ordered back to the depot, and remained on recruiting service the rest of the war. Finally, Robert S. Smith was appointed a second lieutenant in the 2nd U.S. Dragoons on May 4, 1861. He remained on recruiting service through promotions to first lieutenant and captain. Smith did not actually join his regiment until September 5, 1864, over three years after his appointment! Two weeks later he saw his first combat while leading his company at the battle of Opequon, or 3rd Winchester on September 19th. Interestingly, his testimony of valor observed on the field in his first fight was later significant in the award of the Medal of Honor to First Sergeant Conrad Schmidt of Company K.
The concluding post of this series will discuss the recruiting stations and list the sources used to compile the article.